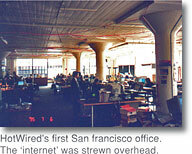 In 1994 Wired Magazine moved from announcing the future to helping invent it. 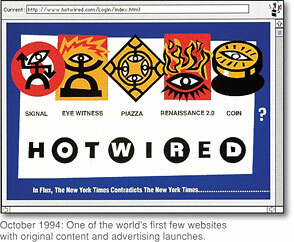 P+K were the creative directors of Hot Wired and Wired Digital, from inception through 1999. 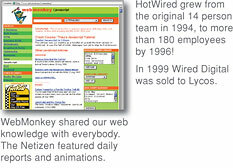 HotWired's small team created the world's first website with original content and advertising, as well as some of the earliest visual language and 'user interface' models still in use today. 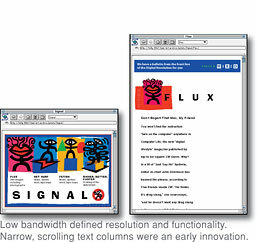 The determining factor – then and now – is bandwidth. Ironically higher bandwidth has only increased the challenge to keep story-telling simple, clear & bold. 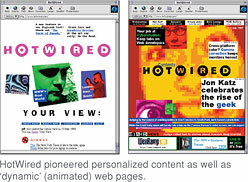 As the editorial and business potential of web media became more apparent, Wired poured the magazine's profits into web R&D. 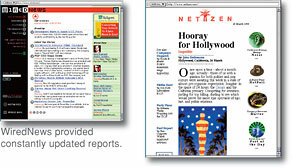 WiredDigital created many websites, including WiredNews, The Netizen (a precursor to blogging), and Web Monkey – which taught anyone how to build their own website.